The ALMA telescope in Chile has transformed how we see the universe, showing us otherwise invisible parts of the cosmos. This array of incredibly precise antennas studies a comparatively high-frequency sliver of radio light: waves that range from a few tenths of a millimeter to several millimeters in length. Recently, scientists pushed ALMA to its limits, harnessing the array's highest-frequency (shortest wavelength) capabilities, which peer into a part of the electromagnetic spectrum that straddles the line between infrared light and radio waves. "High-frequency radio observations like these are normally not possible from the ground," said Brett McGuire, a chemist at the National Radio Astronomy Observatory in Charlottesville, Virginia, and lead author on a paper appearing in the Astrophysical Journal Letters. "They require the extreme precision and sensitivity of ALMA, along with some of the driest and most stable atmospheric conditions that can be found on Earth." Under ideal atmospheric conditions, which occurred on the evening of 5 April 2018, astronomers trained ALMA's highest-frequency, submillimeter vision on a curious region of the Cat's Paw Nebula (also known as NGC 6334I), a star-forming complex located about 4,300 light-years from Earth in the direction of the southern constellation Scorpius. To observe at higher frequencies, the ALMA antennas are designed to accommodate a series of "bands" — numbered 1 to 10 — that each study a particular sliver of the spectrum. The Band 10 receivers observe at the highest frequency (shortest wavelengths) of any of the ALMA instruments, covering wavelengths from 0.3 to 0.4 millimeters (787 to 950 gigahertz), which is also considered to be long-wavelength infrared light. One of ALMA's first Band 10 results was also one of the most challenging, the direct observation of jets of water vapor streaming away from one of the massive protostars in the region. ALMA was able to detect the submillimeter-wavelength light naturally emitted by heavy water (water molecules made up of oxygen, hydrogen and deuterium atoms, which are hydrogen atoms with a proton and a neutron in their nucleus). "Normally, we wouldn't be able to directly see this particular signal at all from the ground," said Crystal Brogan, an astronomer at the NRAO and co-author on the paper. "Earth's atmosphere, even at remarkably arid places, still contains enough water vapor to completely overwhelm this signal from any cosmic source. During exceptionally pristine conditions in the high Atacama Desert, however, ALMA can in fact detect that signal. This is something no other telescope on Earth can achieve." These observations also show that in the regions where this water is slamming into the surrounding gas, low-frequency water masers – naturally occurring microwave versions of lasers — flare up. The masers were detected in complementary observations by the National Science Foundation's Very Large Array. 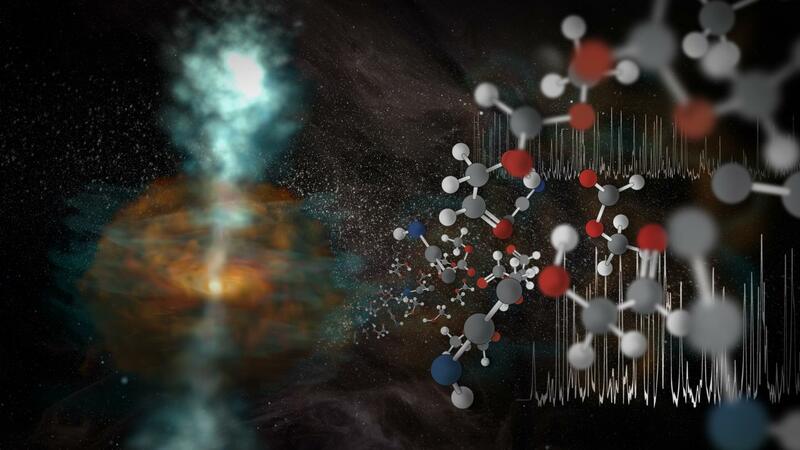 In addition to making striking images of objects in space, ALMA is also a supremely sensitive cosmic chemical sensor. As molecules tumble and vibrate in space, they naturally emit light at specific wavelengths, which appear as spikes and dips on a spectrum. All of ALMA's receiver bands can detect these unique spectral fingerprints, but those lines at the highest frequencies offer unique insight into lighter, important chemicals, like heavy water. They also provide the ability to see signals from complex, warm molecules, which have weaker spectral lines at lower frequencies. Using Band 10, the researchers were able to observe a region of the spectrum that is extraordinarily rich in molecular fingerprints, including glycoaldehyde, the simplest sugar-related molecule. When compared to previous best-in-the-world observations of the same source with the European Space Agency's Herschel Space Observatory, the ALMA observations detected more than ten times as many spectral lines. "We detected a wealth of complex organic molecules surrounding this massive star-forming region," said McGuire. "These results have been received with excitement by the astronomical community and show once again how ALMA will reshape our understanding of the universe." ALMA is able to take advantage of these rare windows of opportunity when the atmospheric conditions are "just right" by using dynamic scheduling. That means, the telescope operators and astronomers carefully monitor the weather and conduct those planned observations that best fit the prevailing conditions. "There certainly are quite a few conditions that have to be met to conduct a successful observation using Band 10," concluded Brogan. "But these new ALMA results demonstrate just how important these observations can be." "To remain at the forefront of discovery, observatories must continuously innovate to drive the leading edge of what astronomy can accomplish," said Joe Pesce, the program director for the National Radio Astronomy Observatory at NSF. "That is a core element of NSF's NRAO, and its ALMA telescope, and this discovery pushes the limit of what is possible through ground-based astronomy."